This news is going to hurt a bit, but then again I'm guessing you are already aware of the situation. 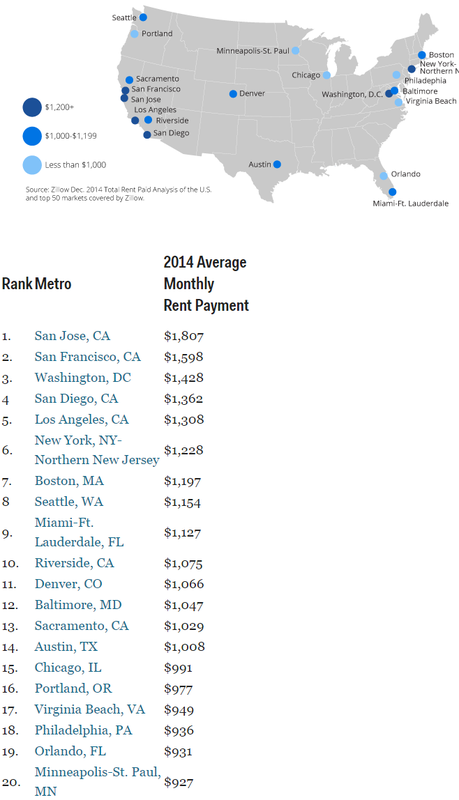 The San Jose Metro now has the highest average monthly rent out of any metro are in the country at $1,807 per month. You can see the top 20 list below. San Francisco is right behind us followed by Washington DC, San Diego, Los Angeles, and New York/New Jersey. Does $1800 average in SJ include the jungle? I'd like to call BS on this one.. the San Jose Metro (per Zillow criteria) includes Palo Alto, Mountain View, Cupertino, Sunnyvale and Santa Clara and if we exclude those, SF would take the No1 spot, BY A MILE. I don't understand your point. That's how metro areas work. Yes, if SF weren't so small, it wouldn't include Oakland in its metro which lowers its average rent. But it is. Because no renter is shopping a "metro area" nor are apartments offered by "metro area". It's an aggregational fiction that might be of interest statistically, but misleads a would-be renter, who might be led to believe there aren't $1,200 rental opportunities provided they don't wish to live in a Cupertino school district. "... misleads a would-be renter, who might be led to believe there aren't $1,200 rental opportunities ..."
Renters with 4th grade reading comprehension understand that "average monthly rent" doesn't mean that there aren't opportunities to rent for less, idiot. I gotta agree with 5:34 PM/9:34 AM. As long as someone knows that "average" means "average", there's nothing misleading about it. These prices ate bard off studio to 1 bedroom in not such great areas. A 3 bedroom house for rent in Nashville in a nice area starts around 1850$ it doesn't mean modern or new that's an old kitchen and bathroom at about 1100 square ft. A one bedroom in Los Angeles in the hood is over a grand. That's in sun Valley. Double these prices for accurate rental prices.